Cetshwayo kaMpande (/kɛtʃˈwaɪ.oʊ/; Zulu pronunciation: [kǀétʃwajo kámpande]; c. 1826 – 8 February 1884) was the king[lower-alpha 1] of the Zulu Kingdom from 1872 to 1879 and its leader during the Anglo-Zulu War of 1879. His name has been transliterated as Cetawayo, Cetewayo, Cetywajo and Ketchwayo. He famously led the Zulu nation to victory against the British in the Battle of Isandlwana. Cetshwayo was a son of Zulu king Mpande and Queen Ngqumbazi, half-nephew of Zulu king Shaka and grandson of Senzangakhona kaJama. In 1856 he defeated and killed in battle his younger brother Mbuyazi, Mpande's favorite, at the Battle of Ndondakusuka. Almost all Mbuyazi's followers were massacred in the aftermath of the battle, including five of Cetshwayo's own brothers. Like Nero, he killed his own mother, and then caused several persons to be executed because they did not show sufficient sorrow at her death. Following this he became the effective ruler of the Zulu people. He did not ascend to the throne, however, as his father was still alive. Stories from that time regarding his huge size vary, saying he stood at least between 6 feet 6 inches (198 cm) tall and 6 feet 8 inches (203 cm) and weighed close to 25 stone (350 lb; 160 kg). His other brother, Umtonga, was still a potential rival. Cetshwayo also kept an eye on his father's new wives and children for potential rivals, ordering the death of his favourite wife Nomantshali and her children in 1861. Though two sons escaped, the youngest was murdered in front of the king. After these events Umtonga fled to the Boers' side of the border and Cetshwayo had to make deals with the Boers to get him back. In 1865, Umtonga did the same thing, apparently making Cetshwayo believe that Umtonga would organize help from the Boers against him, the same way his father had overthrown his predecessor, Dingaan. Mpande died in 1872. 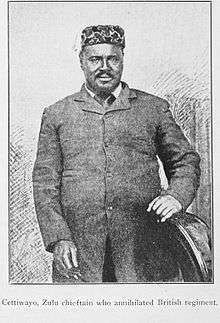 His death was concealed at first, to ensure a smooth transition; Cetshwayo was installed as king on 1 September 1873. Sir Theophilus Shepstone, who annexed the Transvaal for Britain, crowned Cetshwayo in a shoddy, wet affair that was more of a farce than anything else, but turned on the Zulus as he felt he was undermined by Cetshwayo's skilful negotiating for land area compromised by encroaching Boers and the fact that the Boundary Commission established to examine the ownership of the land in question actually ruled in favour of the Zulus. The report was subsequently buried. As was customary, he established a new capital for the nation and called it Ulundi (the high place). He expanded his army and readopted many methods of Shaka. He also equipped his impis with muskets, though evidence of their use is limited. He banished European missionaries from his land. He might have incited other native African peoples to rebel against Boers in Transvaal. Cetshwayo (called Cettiwayo in the caption of the photo above), in Cape Town shortly after his capture in the 1879 Anglo-Zulu War. He led several victories against the British army early in the war. In 1878, Sir Henry Bartle Frere, British High Commissioner for South Africa, sought to confederate South Africa the same way Canada had been, and felt that this could not be done while there was a powerful and independent Zulu state. So he began to demand reparations for border infractions and forced his subordinates to send carping messages complaining about Cetshwyo's rule, seeking to provoke the Zulu King. They succeeded, but Cetshwayo kept his calm, considering the British to be his friends and being aware of the power of the British army. He did, however, state that he and Frere were equals and since he did not complain about how Frere ruled, the same courtesy should be observed by Frere in regards to Zululand. Eventually, Frere issued an ultimatum that demanded that he should effectively disband his army. His refusal led to the Zulu War in 1879, though it should be noted that he continually sought to make peace after the first battle at Isandhlwana. After an initial crushing but costly Zulu victory over the British at the Battle of Isandlwana, and the failure of the other two columns of the three pronged British attack to make headway - indeed, one was bogged down in the Siege of Eshowe - the British retreated, other columns suffering two further defeats to Zulu armies in the field at the Battle of Intombe and the Battle of Hlobane. However, the British follow-up victories at the famous Battle of Rorke's Drift and the Battle of Kambula restored some British pride. While this retreat gave the chance for a Zulu counter-attack deep into Natal, Cetshwayo refused, his intention only being to repulse the British, not provoke further reprisals. Cetshwayo, King of the Zulus came to England in 1882 when this portrait was painted by Karl Rudolf Sohn. However, the British then returned to Zululand with a far larger and better armed force, finally capturing the Zulu capital at the Battle of Ulundi, in which the British, having learned their lesson from their defeat at Isandlwana, set up a hollow square on the open plain, armed with cannons and Gatling Guns. The battle lasted approximately 45 minutes before the British unleashed the cavalry to rout the Zulus. After Ulundi was taken and torched on 4 July, Cetshwayo was deposed and exiled, first to Cape Town, and then to London, returning to Zululand only in 1883. From 1881, his cause had been taken up by, among others, Lady Florence Dixie, correspondent of the London Morning Post, who wrote articles and books in his support. This, along with his gentle and dignified manner, gave rise to public sympathy and the sentiment that he had been ill-used and shoddily treated by Bartle Frere and Lord Chelmsford. As he conquered a tribe, he enrolled its remnants in his army, so that they might in their turn help to conquer others. He armed his regiments with the short stabbing assegai, instead of the throwing assegai which they had been accustomed to use, and kept them subject to an iron discipline. If a man was observed to show the slightest hesitation about coming to close quarters with the enemy, he was executed as soon as the fight was over. If a regiment had the misfortune to be defeated, whether by its own fault or not, it would on its return to headquarters find that a goodly proportion of the wives and children belonging to it had been beaten to death by Cetshwayo's orders, and that he was waiting their arrival to complete his vengeance by dashing out their brains. The result was, that though Cetshwayo's armies were occasionally annihilated, they were rarely defeated, and they never ran away. By 1882 differences between two Zulu factions—pro-Cetshwayo uSuthus and three rival chiefs UZibhebhu—had erupted into a blood feud and civil war. In 1883, the British tried to restore Cetshwayo to rule at least part of his previous territory but the attempt failed. With the aid of Boer mercenaries, Chief UZibhebhu started a war contesting the succession and on 22 July 1883 he attacked Cetshwayo's new kraal in Ulundi. Cetshwayo was wounded but escaped to the forest at Nkandla. After pleas from the Resident Commissioner, Sir Melmoth Osborne, Cetshwayo moved to Eshowe, where he died a few months later on 8 February 1884, aged 57–60, presumably from a heart attack, although there are some theories that he may have been poisoned. His body was buried in a field within sight of the forest, to the south near Nkunzane River. The remains of the wagon which carried his corpse to the site was placed on the grave, and its remains may be seen at Ondini Museum, near Ulundi. Cetshwayo is remembered by historians as being the last king of an independent Zulu nation. His son Dinizulu, as heir to the throne, was proclaimed king on 20 May 1884, supported by (other) Boer mercenaries. A blue plaque commemorates Cetshwayo at 18 Melbury Road, Kensington. Cetshwayo figures in three adventure novels by H. Rider Haggard: The Witch's Head (1885), Black Heart and White Heart (1900) and Finished (1917), and in his non-fiction book Cetywayo and His White Neighbours (1882). He is mentioned in John Buchan's novel Prester John. A character in the opera Leo, the Royal Cadet by Oscar Ferdinand Telgmann and George Frederick Cameron was named in his honour in 1889. In the 1964 film Zulu, he was played by Mangosuthu Buthelezi, his own great-grandson and the future leader of the Inkatha Freedom Party. In the 1979 film Zulu Dawn, he was played by Simon Sabela. ↑ Chisholm, Hugh, ed. (1911). "Cetywayo". Encyclopædia Britannica. 5 (11th ed.). Cambridge University Press. pp. 776–777. 1 2 Rider Haggard, Henry (1882). Cetywayo and His White Neighbours: Or, Remarks on Recent Events in Zululand, Natal, and the Transvaal. AMS Press. ↑ Morris, Donald R. (1994). The Washing of the Spears: A History of the Rise of the Zulu Nation Under Shaka and Its Fall in the Zulu War of 1879. Pimlico. pp. 190–199. ISBN 978-0-7126-6105-8. ↑ Meredith, Martin (2007). Diamonds, Gold, and War: The British, the Boers, and the Making of South Africa. PublicAffairs. p. 88. ISBN 978-1-58648-473-6. ↑ "Biography of Cetshwayo kaMpande, the last king of an independent Zulu nation". Retrieved 2006-12-17. ↑ "CETSHWAYO, KA MPANDE, KING OF THE ZULUS (C.1832–1884)". English Heritage. Retrieved 2012-07-01. 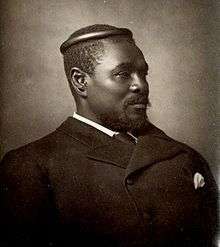 Wikimedia Commons has media related to Cetshwayo kaMpande.